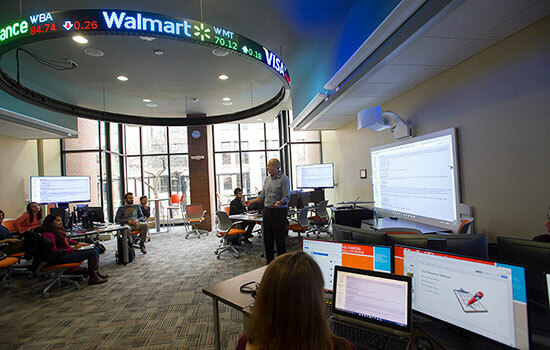 The Online Executive MBA program in Rochester Institute of Technology’s Saunders College of Business ranked second in the category of career outcomes for graduates, and 13th overall, in the list of top online MBA programs by Poets&Quants, a leading resource for coverage of graduate business education. Rankings were derived from three criteria: quality of incoming students, an assessment by graduates of the MBA experience in both academic and extracurricular areas, and career outcomes of the program’s graduates. Universities were surveyed on a variety of statistics including admission standards and global immersion trips. Alumni surveys, which were sent to MBA graduates who were two years removed from the program, inquired on a variety of topics including whether the program fulfilled their expectations and whether they would recommend the program to others. Saunders College of Business Dean Jacqueline Mozrall believes the ranking helps to continue to tell the story of the college. Most recently, Saunders College’s Online Executive MBA program was ranked eighth in the nation by Princeton Review and 36th in the nation in the 2018 list of U.S. News & World Report’s Best Online Programs. The complete Poets&Quants ranking list can be found here.